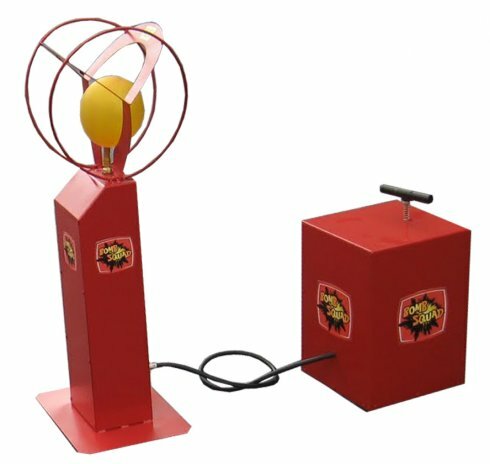 Brand new for 2014 is our Balloon Detonation game where two players race to be the first to explode their balloon using the 'detonator' style air pumps. A pair of pumps and detonator units are supplied for head to head competition. A great competitive and attention grabbing game suitable for fun days, team building events, or promotional use with your own branded balloons. The game can be used indoors or outside and is suitable for ages 5 - adult. This activity can be supplied staffed or unstaffed as required. The game does not require a power supply. If you have any queries, questions, or would like to hire our Balloon Detontation for your event please call us on the number below or click to enquire and we will do all we can to help.